When we buy a new computer, most of us pay special attention to aspects like the processor, the quality of the graphics and the memory capacity. The monitor is usually taken for granted and while it is the most obvious part of a computer, it is probably the last thing that is considered when trying to purchase a new machine. You may check a few details about the monitor included or if you already have one, you may focus on the engine, thinking that you may get an improved option at a later stage. The reality is that if you invest on the latest gaming PC but dismiss the importance of the screen, you will eventually realize that even the most powerful machine seems limited when it is combined with a standard monitor. If you don’t have a top quality 27 inch gaming monitor yet, you may want to consider getting one in order to fully enjoy your gaming experience. The options in this list are highly recommended and are guaranteed to provide durability and excellent performance but first, let’s find out what you need to look for when buying a gaming monitor. One of the main things to check when searching an advanced gaming monitor is G-Sync technology, a feature that can be found on models like the ROG Swift PG278Q G-Sync gaming monitor from Asus. Even if you think that your current 1080p monitor is working well, there have been many changes in the world of gaming systems and it may be worth considering an upgrade. It’s been a decade since the time when 1080p monitors were seen as the best option available. The technology that supports these high resolution devices has been updated several times throughout the years and many improvement have been implemented since then. For instance, the engines that run these amped-up CPUs are now more powerful and support more features to offer an enhanced gaming experience. Just think that a new monitor would help to make things even better. These are some of the PC gaming upgrades that have been implemented over the years and that should prompt you to consider a new 27 inch gaming monitor in order to enjoy gaming in its full potential. Input lag is one of the aspects that you need to keep in mind when it comes to gaming technology. A good input lag is crucial for gamers as it could determine their success. The mouse should react immediately when you are playing a first-person shooter game and need to turn to the left or right, otherwise you could be in trouble. When there is poor input lag, you would experience a delay in the action on the screen after moving your mouse, which could be very frustrating. G-Sync technology can make a huge difference here because the hardware that supports it, can communicate using a controller on the graphics card and the controller on the monitor itself. The latest monitors (such as the Asus ROG Swift) have this controller installed and support G-Sync technology, enabling users to enjoy a fast and seamless gaming experience. It is important to keep in mind that the majority of PC games currently available in the market are optimized for 16:9 format. Older monitors are likely to use 16.10 or 4:3 formats, which means that you won’t be able to enjoy the latest gaming titles at their best, unless you upgrade your monitor. A display that supports a high resolution requires less filtering so the FPS is less likely to be reduced and you shouldn’t experience distortion while you play. High resolution will allow you to fully enjoy the graphics on your favorite games. The refresh rate of a monitor is what determines that time that it takes for the screen to refresh the display. If a monitor has a 60Hz refresh rate, it means that it can refresh 60 times per second. Most modern PC games are generally able to go beyond 60Hz per second. Therefore, if still have an older monitor which can’t display more than 60 fps, your gaming experience will be limited, even if your PC has been upgraded. With a high refresh rate, you will be able to play better and the latest monitors can push anything between 120Hz to 144Hz, ensuring that you get the most out of your games. Just bear in mind that an increase in the resolution of your monitor also means that more bandwidth will be needed in order to push the refresh rate. The response time is generally the amount of time that the system takes to respond to a request for an action to be completed. 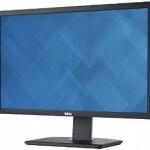 However, when it comes to monitors, it indicates how quickly the display can change its pixels from black-to-white or grey-to-grey. It simply determines how fast a display can go from black to white or grey to grey pixels. The response time is measured in milliseconds. Color gamut matters if you want to use your computer for professional graphic design and other tasks besides gaming. It represents color reproduction and it is an essential feature for users who use Adobe Photoshop and image editing. Most gaming monitors use TN panel technology and the latest models can support up to 4 billion colors. Generally, the monitors that include color gamut are in the IPS category and offer 10+ billion colors or 10 bit depth. The majority of monitors available feature TN (Twisted Nematic) film panels. They first versions of LCD and LED monitors used TN and this technology offers a variety of benefits including faster response time and capacity to support refresh rates over 120Hz. They are also more affordable as they can be produced for less. However, there are also some downsides such as the fact that they have limited color gamut range and restrictive viewing angles in most cases. In vertical viewing position, the image is likely to fade dramatically. IPS, which stands for In-plane Switching is a technology created by Hitachi in 1996, although it only became available widely several years after that. It is also known as TFT and there are many different versions on the market and improvements that have been implemented over the years. The main advantages of IPS is that it supports 10-bit color panels and provides wider viewing angles. However, the response times are slower than TN and it can’t operate at 120Hz refresh rates. Bezel thickness is the frame around the screen and although it may seem as irrelevant at first, the truth is that it can be decisive, particularly if you work with multiple monitor setups. If you need to arrange monitors side by side, the bezel thickness would need to be considered. Nowadays, many monitor bezels have less than one inch of thickness. Many people are still using VGA cables to connect the monitor to their PC without keeping in mind that this restricts the overall viewing capacity to a resolution that can only support 1080p at 60Hz, or just 1440p at 30Hz. Modern gaming monitors are designed to display port connectivity and the latest models have HDMI 2.0 capacity. While VGA, DVI and HDMI connectivity are still supported, advanced monitors also include HDMI 2.0 or Thunderbolt. For avid gamers, the Asus ROG is a perfect solution as it supports all the necessary features to enjoy gaming at its best. 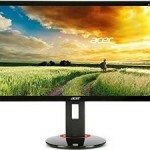 It offers a refresh rate of 144Hz and a rapid response of just 1ms. It supports Nvidia G-Sync technology that syncs the screen’s refresh rate to the GPU. This device makes connectivity simple and it comes with all the ports and connections that you may require, including USB 3.0 ports. To enjoy a superb gaming experience, the monitor uses GamePlus technology, which is ideal for FPS games and RTS/MOBA games. The 6mm bezel suits multi-display gaming setups and the monitor also offers complete ergonomic tilt, swivel, pivot and height adjustment for added comfort. The VESA mount capability ensures that the monitor is placed in the best possible way. At $720, it is not exactly an affordable option, but it is the top one. Featuring full HD support with 1920 x 1080 maximum resolution and Nvidia 3D Vision 2, as well as flicker-free 3D images, this ergonomically designed monitor allows you to get optimal view. It can be tilted and the height can be adjusted for a comfortable viewing experience. The 16.7 million color display and the response time of 2ms make this model a great option for gaming and the connections include D-Sub, HDMI, Dual-link and DVI-D. 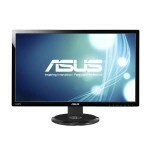 This widespread monitor from Asus also allows you to enjoy seamless performance with its 144Hz rapid refresh rate. The Splendid Video Intelligence Technology supports vivid image and brilliant colors. It is available from $390 USD. The XB280HK stands out as the first 4k2k display which features Nvidia G-Sync technology. The clear graphics and vibrant color will capture you from the start and will enrich your gaming experience. This 28 inch LED backlit display will allow you to enjoy an impressive resolution that standard 1080p monitors can’t support. It is set to improve dramatically your gaming thanks to the 170/170 viewing angles. The Acer XB280HK will not only please those who are seeking for advanced technology but will also appeal to users who are environmentally conscious. The monitor is made from eco-friendly post-consumer recycled materials and its ergonomic design with multi-function stand can be adjusted for tilt, swivel and height. You can get it from around $705. If you are looking for a professional grade solution and are willing to spend as much as $1,100, the UltraSharp U2713HM from Dell could be the right option. This monitor will suit gamers and professionals who require the best image and graphics since it features a remarkable 2560 x 1440 (WQHD) resolution display with 1.07 billion colors, It also supports a variety of connectivity options including DisplayPort with audio, DVI-D (HDCP) and USB, as well as VGA and HDMI connectors. The thin, matte black bezel and the non-glare screen make this monitor ideal for multi-screen setups. The height-adjustable stand, intuitive controls and touch switches can guarantee comfortable viewing. If you love gaming and want to enjoy the ultimate experience without restrictions, you should consider upgrading your monitor to a 27 or 28″ model that supports advanced technology. Getting a newer monitor will allow you to fully enjoy the graphics of your favorite games while ensuring that your game play is not affected by a slow performance. Pairing the latest PC technology with an older monitor could hamper your gaming experience so why not updating your monitor as well to get a complete high-tech gaming machine.